The mission was chosen by NASA on January 4, 2017 as one of two missions for the agency's Discovery Program, a series of low-cost missions to solar system targets. 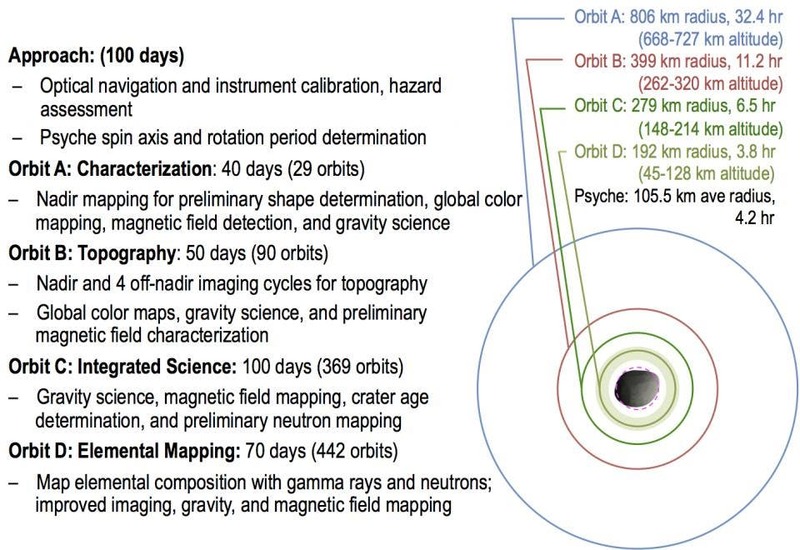 The Psyche spacecraft is targeted to launch in October 2023 and travel to the asteroid using solar-electric (low-thrust) propulsion, arriving in 2030, follwing an Earth gravity assist spacecraft maneuver in 2024 and a Mars flyby in 2025. After a six-year cruise, the mission plan calls for 20 months spent in orbit around the asteroid, mapping it and studying its properties. Every world explored so far by humans (except gas giant planets such as Jupiter or Saturn) has a surface of ice or rock or a mixture of the two. 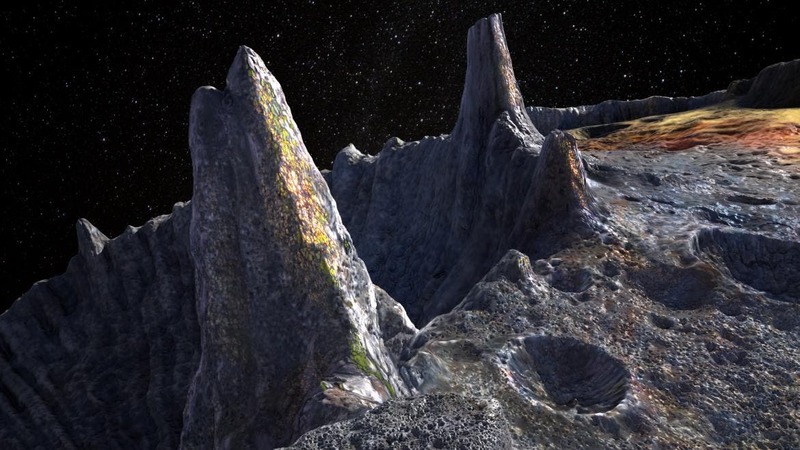 Deep within the terrestrial planets, including Earth, scientists infer the presence of metallic cores, but these lie unreachably far below the planets' rocky mantles and crusts. Because we cannot see or measure Earth’s core directly, 16 Psyche offers a unique window into the violent history of collisions and accretion that created the terrestrial planets. 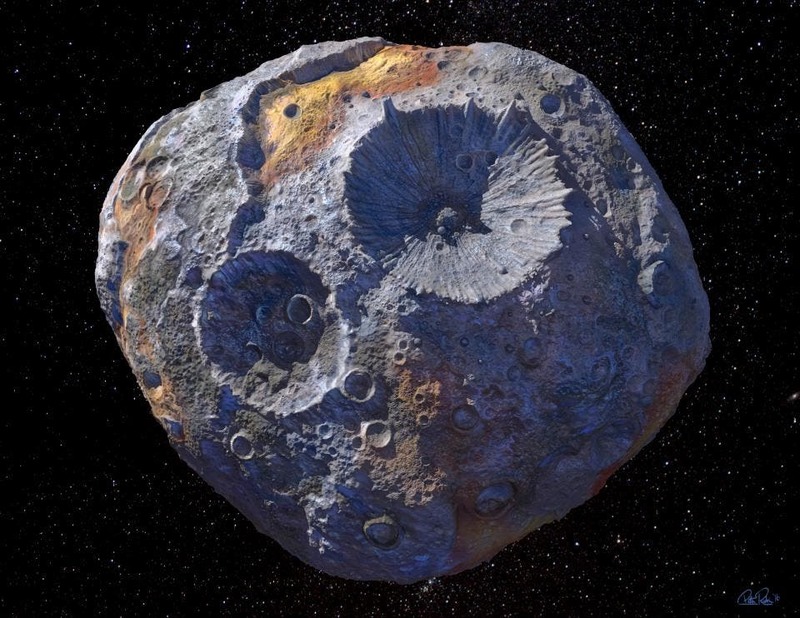 16 Psyche follows an orbit in the outer part of the main asteroid belt, at an average distance from the Sun of 3 astronomical units (AU); Earth orbits at 1 AU. Psyche is large (about 150 miles in diameter), dense (7,000 kg/m³), and made almost entirely of nickel-iron metal. It is the only known place in our solar system where we can examine directly what is almost certainly a metallic core. What is Psyche’s story? One scenario is that long ago, a protoplanet that had separated internally into a rocky mantle and iron core suffered violent impacts that stripped away its mantle, leaving only the metal core. Or is Psyche a survivor of some more unusual process not yet imagined? What can it tell us about how planets everywhere form and about what's inside the Earth, Mars, Venus, and Mercury? The Psyche Mission, targeted to launch in October of 2023 and will arrive at 16 Psyche in 2030. Plans call for it to spend 12 months at the asteroid, performing science operations from four staging orbits, which become successively closer. The Multispectral Imager provides high-resolution images using filters to discriminate between 16 Psyche's metallic and silicate constituents. The instrument consists of a pair of identical cameras designed to acquire geologic, compositional, and topographic data. The purpose of the second camera is to provide redundancy for mission-critical optical navigation. The science team is based at Arizona State University. The Gamma Ray and Neutron Spectrometer will detect, measure, and map 16 Psyche's elemental composition. The instrument is mounted on a 2-m boom to distance the sensors from background radiation created by energetic particles interacting with the spacecraft and to provide an unobstructed field of view. The science team is based at the Applied Physics Laboratory at Johns Hopkins University. 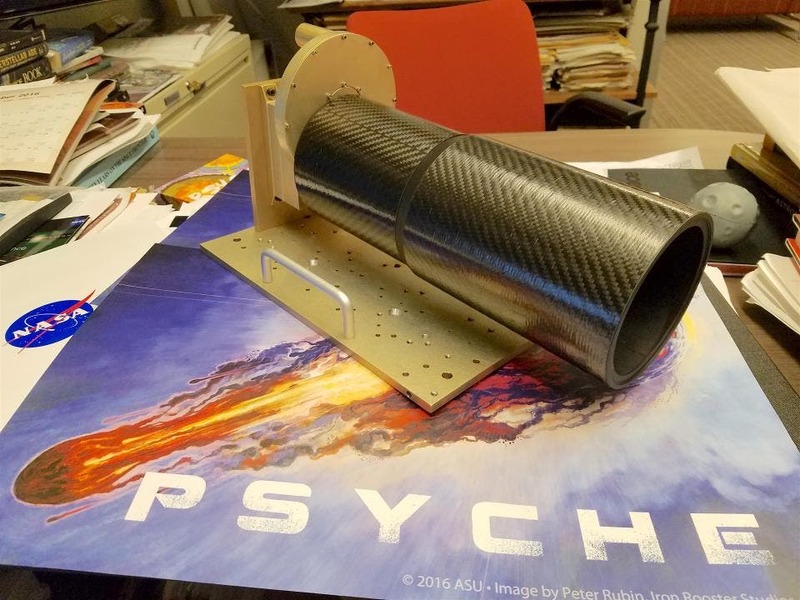 The Psyche Magnetometer is designed to detect and measure the remanent magnetic field of the asteroid. It is composed of two identical high-sensitivity magnetic field sensors located at the middle and outer end of a 2-m (6-foot) boom. The science team is based at Massachusetts Institute of Technology and the University of California Los Angeles. The Psyche mission will use the X-band radio telecommunications system to measure 16 Psyche's gravity field to high precision. When combined with topography derived from onboard imagery, this will provide information on the interior structure of Psyche. The science team is based at MIT and JPL. Principal investigator Lindy Elkins-Tanton, director of ASU’s School of Earth and Space Exploration (SESE), heads the Psyche Mission scientific team. Other SESE scientists include Jim Bell (deputy principal investigator and co-investigator), Erik Asphaug (co-investigator), and David Williams (co-investigator).